Ok, I’m impressed. Have you seen Sherbourne Common? If you haven’t, I suggest that you check it out. This is the most recent project to be unveiled as part of Toronto’s ambitious waterfront development plan, better known as the “New Blue Edge”, a work-in-progress that entails 800 hectares of land along Toronto’s waterfront. 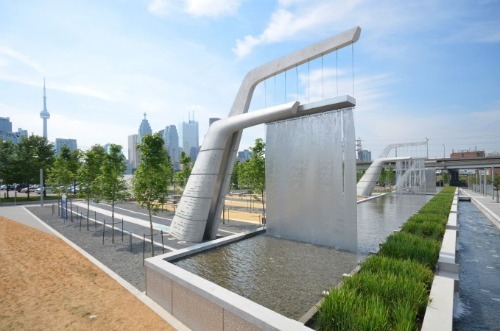 Designed by landscape architects Phillips Farevaag Smallenberg, Sherbourne Common is an example of how critical infrastructure – in this case a neighbourhood storm water treatment facility – can be fully integrated into a neighbourhood. The brilliant part is that the facility doubles as an elegant public space where current and future residents of the planned East Bay Front community will be able to gather, play and interact. skating rink, a playground, seating areas, a green space and a building that will soon house a café. The ingenious design turns infrastructure, commonly considered to be a necessary evil by most urbanists, into a public amenity. Since when have you heard that a water treatment plant will draw people to a neighbourhood and raise property values? As a planner who has spent the better part of the last two years working alongside engineers to develop water and wastewater infrastructure in the Greater Toronto Area in an environmentally and socially responsible manner, Sherbourne Common is an inspiration! For another example of infrastructure doubling as public amenity, you can read more about River Bank State Park in the Hamilton Heights neighbourhood of New York City. This entry was posted in Planning and tagged community, design, planning, sustainability, urban planning. Bookmark the permalink. Thank you for posting on our Blog. 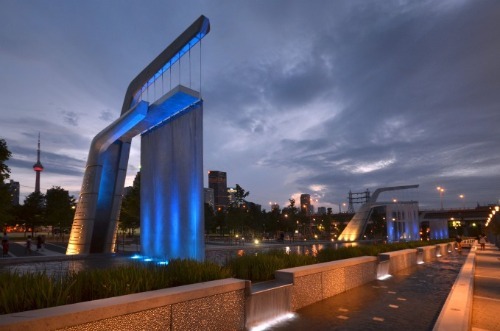 I don’t live far from Sherbourne Common and I have visited the park several times since its completion. There are always kids playing, adults basking in the sun resting, or reading a book. This speaks volumes considering the park is not far from the Gardiner Expressway (one of Toronto’s busiest highways) and in an area that is slated for development with little adjacent uses at the moment. Imagine the scene once the planned neighbourhood is completed!